The AMP - Best SEO Friendly AMP Blogger Template! Are you looking for any AMP Supported Blogger Template? Well, In here I am sharing a high quality and professional AMP (Accelerated Mobile Pages) Blogger Template. This is our first Template of AMP. Nowadays Accelerated Mobile Pages or AMP is the most important part of Mobile blog. You'll be more benefited with this project. Basically, AMP is the compatible with CMS based blog. 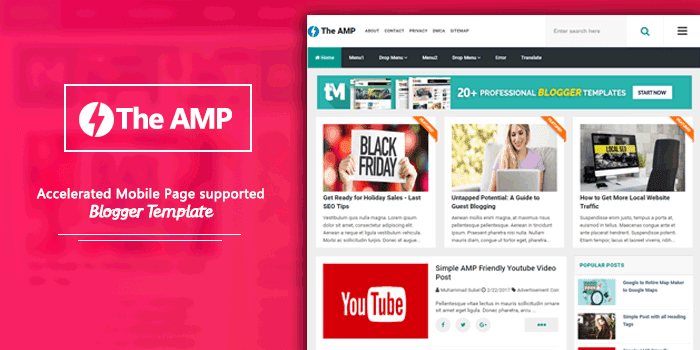 Now you can also install AMP Blogger Template in your any Blogspot platform. Template Market sharing this awesome and SEO friendly blogger template for you. The AMP is the first AMP Friendly blogger template designed by MS Design and published by Templatemark. You can use this template on your blog for Accelerated Moible Pages. If you start the blog from first, then it will be easy for your. And if you want to install it on your old blog, then you'll need to edit your all previous posts with AMP post formate that we mentioned in Template Documantiona. You can also learn how to make a AMP friendly blogspot blogger post with The AMP Blogger Template. 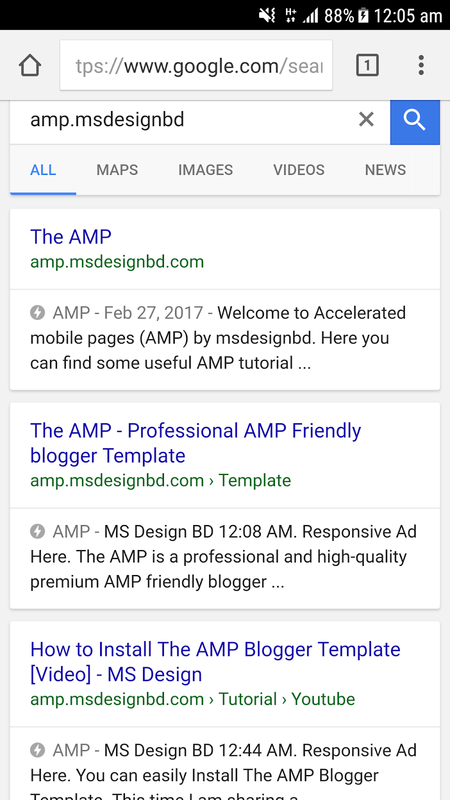 Previous somedays ago, we installed The AMP blogger template on amp.msdesignbd.com and we find positive result. Google successfully indexed our all posts as AMP friendly. Check out below screenschots. If you looking for a high quality and Professional AMP Blogger Template, Then it will be perfect for your blog. It also perfect for Event niche blog also. The AMP blogger template build with lots of attractive features and unique layout design. In this template, we used a simple related posts widget that you can't find on other AMP blogger template. You know the template specially designed and build for event niche blogger. That's why we used facebook comment on The AMP blogger template, that will help your for reach with your audience. It is all about the hard work keep it up. How to implement amp in posts or it will auto make the posts amp? Will this AMP will work for the blogsposts? এই থিম কিনবো কিন্তু আমার তো পেপাল বা কর্ড নাই... তাহলে কিভাবে কিনবো? আর একটা কথা জানতে চেয়েছিলাম এইটা কী.. বাংলা হবে থিম.